I wake up and peek behind the blind. The rain has stopped and the sun is breaking through the clouds. I tried to get up to catch the sunrise but it was bucketing it down so I retreated under the covers. This time though, I pull on my jeans, grab my camera and head for the beach. It’s 8am, the first of the day trippers to Iona haven’t arrived yet so my walk along the single-track road is lonesome, and not in a bad way. I pass a field of sheep – some white, some black – who are lazily grazing. I wonder what the hell am I doing out here, zipped up in my wind breaker when I could be cosied up in bed for another hour or two. The road comes to an end. To the left is Iona Hostel, while in front of me is a gate. There are no directions of where to go as such – more advice on what not to do. Nevertheless, I lift the chain that rests over the post and make my way through. More sheep and a well-trodden path. There’s a gate, and sand. I have a good feeling about this. I make my way through (a latch this time) and there it is – the White Strands of the Monks, a beautiful white sand beach that gently slopes to the sea, which if the light is right (and it is) is a vibrant turquoise. 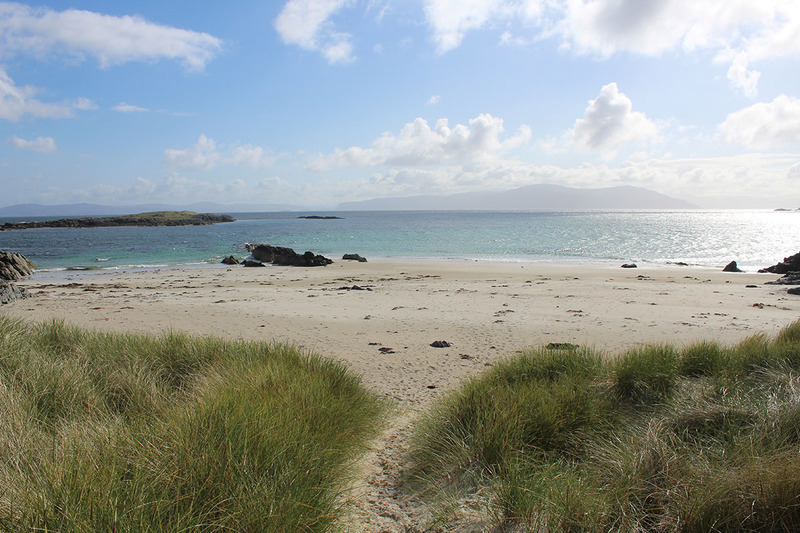 The Gaelic name of this beach is Traigh Bhan Nam Monach, named after the mass slaughter of monks here in the 8th century at the hands of the Vikings. But depressing thoughts are far away from me now. I feel uplifted, at peace. There is not a single other person around and I am choked by the beauty of it all. I sit for a while and take it all in. Iona is a tiny island, just 3 miles by 1.5 miles, off the coast of Mull. It was here in 563 AD that St Columba arrived from Ireland and set up a monastery. The wooden construct of his time is long gone, replaced with a Benedictine abbey and worship has gone on here largely uninterrupted ever since. There are still relics of Columba’s time too, including the mound on which his writing hut once sat as he set down his sermons. The atmosphere is undeniably spiritual. Sure, boat-loads of visitors arrive each day to visit Iona Abbey and take trips out to the nearby isle of Staffa and the Treshnish Isles, but once they leave for the day, calmness descends. Even to an atheist like me it has a transformative power. If I had more time I would go for a swim (I know it would be cold but I don’t care) but I have a ferry to catch. 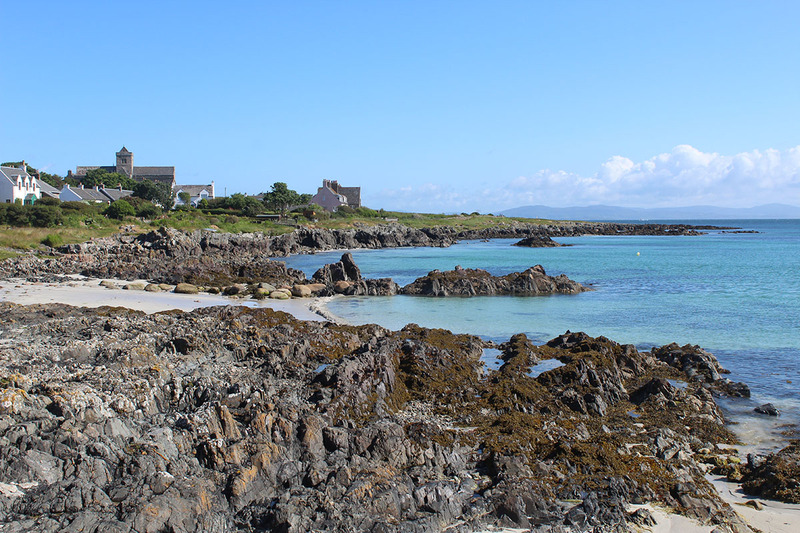 Still, I’m glad I stayed the night at the nearby Iona Pods as I got to have the place to myself for a little. A few days later I meet a woman while walking in the Kilmartin Glen, in inland Argyll. She gave up a busy life in Birmingham for rural life in western Scotland and she tells me that Iona was her undoing. With Iona fresh in my memory, I tell her I have a funny feeling I know what she means.